How do I enroll in a FIG? You enroll in your first-semester classes, including FIG classes, during summer orientation (SOAR) in Madison. You and your SOAR advisor will first confirm that you are eligible to take all the FIG classes and that these classes fit your academic plan. You take all the classes in your FIG; you cannot drop one FIG class without dropping the rest of the FIG classes. Who can enroll in a FIG? Most First-Year Interest Groups are open to all new freshmen (including first-year students whose incoming AP/retroactive credits give them class standing of sophomore or higher). A few FIGs are designed just for students who plan to enter specific degree programs, schools, or colleges, such as Nursing or Engineering. When you browse the catalog of current FIGs, look for the special yellow tags that identify those FIGs. Some FIG classes require certain minimum scores on your placement tests. For example, a FIG that has a foreign-language class may be open only to students who have achieved a tested level of competency in that language. UW–Madison’s chemistry classes require a specific math competency. All incoming freshmen participate in UW–Madison’s Summer Orientation, Advising, and Registration program, also known as SOAR. SOAR for freshman is a two-day program filled with tours and activities to help you get to know this campus and prepare for your semester. On the first day, you will meet with your academic advisor. On the second day, you will continue academic planning and enroll in your fall-semester classes, including your FIG classes. Questions not covered here? Please get in touch with us (see contact info below) and we’ll help. Are the FIG classes the only ones I take? Most freshmen will also enroll for at least one other class of their choosing, along with the classes that make up the FIG. Undergraduates are usually full-time students, which means enrolling for a minimum of 12 credits each semester. Each class is assigned a certain number of credits, depending on how many hours a week the class meets and other factors. The credits of all the classes in a FIG are added together, and you can find that total number listed for each current FIG. If you enroll in a 9-credit FIG, you will likely also choose a class with at least 3 credits to meet the 12-credit minimum credit load. 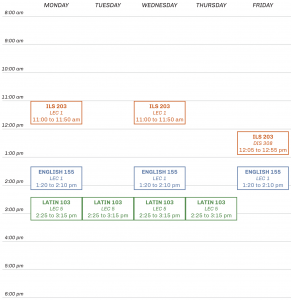 We publish a schedule grid for each of the FIGs to help you see what class times are reserved for the FIG classes. When you choose additional classes, look for class times that don’t overlap with your FIG. Nope, there is no fee beyond your usual tuition expenses. All FIG classes are regular UW classes. The main class will always only be open to you and the other students who enrolled in that FIG, but otherwise it’s just like other standard classes. Some optional activities, such as a study-abroad component, may have costs not covered by your UW tuition. Can I take two classes in a FIG with three classes? First-Year Interest Groups are a whole package: when you enroll, you commit to taking the full set of classes in that FIG. Each class will meet at specific class times, which you can see in the FIG catalog and at enroll.wisc.edu. If you only want to take some, but not all, classes in a FIG, then you (with your SOAR advisor’s help) would enroll in those classes separate from the FIG Program. The main FIG seminar wouldn’t be open to you, but the linked classes may (if seats are still available). Can I drop a class in a FIG? Just as you must enroll in all of the classes in the FIG, dropping a class within a FIG means dropping all the classes in the FIG. This is because we reserve equal numbers of seats in all of the FIG classes and we want everyone in the FIG to have the whole experience. However, after the semester begins, if you have concerns about one of your FIG classes, please contact the FIGs office so we can help. Do you keep a waitlist for full FIGs? Can I reserve a space in a FIG before SOAR? Your SOAR advisor will help you identify which FIGs still have space available. If the FIG you most wanted is already full, we can include you on a waitlist and let you know if a seat becomes available. We know that this can make your semester planning a little messy, so we’ll help you consider other options, such as exploring other FIGs that might be an excellent fit. In some cases, though, you may be able to hold a spot in a FIG until you attend your SOAR session. If you identify a FIG prior to SOAR that feels like your perfect match, send an email to Assistant Director Kari Fernholz. Please include the name of the FIG, your 10-digit campus ID number, and the date of your SOAR visit to Madison. Kari will follow up with you about the possibility of reserving a space. Please remember that all enrollment takes place at SOAR and only after consultation with an advisor. You won’t enroll in a FIG until your UW advisor reviews all your information with you and confirms that it is a good fit. Good luck! The professors in my FIG were the most influential and challenging professors that I have had at this university. These were classes and experiences I never would have had if I wasn’t part of a FIG, and these were experiences that have shaped my perspective, my academic experience, and who I am now.